The weather in Milan has had us thinking that it's already summer but let's not forget we are still in spring. And what better way to remember than eating season's veggies! Take asparagus, they are poor in calories and loaded with vitamins and minerals. They are a good source of folic acid, vitamin A, B vitamins and vitamin C.They are also a fair source of calcium and fiber. They are also used in natural medicine to control some stomach affections, clean the liver, lungs and intestines of toxins. Apart from their depurative effects, they also have a protecting action of the arteries. Consumed regularly, they prevent the development of arteriosclerosis and clean the blood. Cook the egg in boiled water for about 9 minutes and remove the shell carefully. In the meantime, cook the asparagus in boiling water for 2-3 minutes and drain. Place them in a tray or serving dish one next to the other. Sprinkle with olive oil, lmon juice, salt and pepper. Separate the yolk from the white of the egg carefully, then take the yolk and grate it over the asparagus. If you wish you can dice the white and use it to decorate the dish. Turn on the oven to 175°C. Cook the asparagus in boiling water for 2 minutes, drain. Put them in a baking tray (with baking paper) and sprinkle with olive oil (be generous). 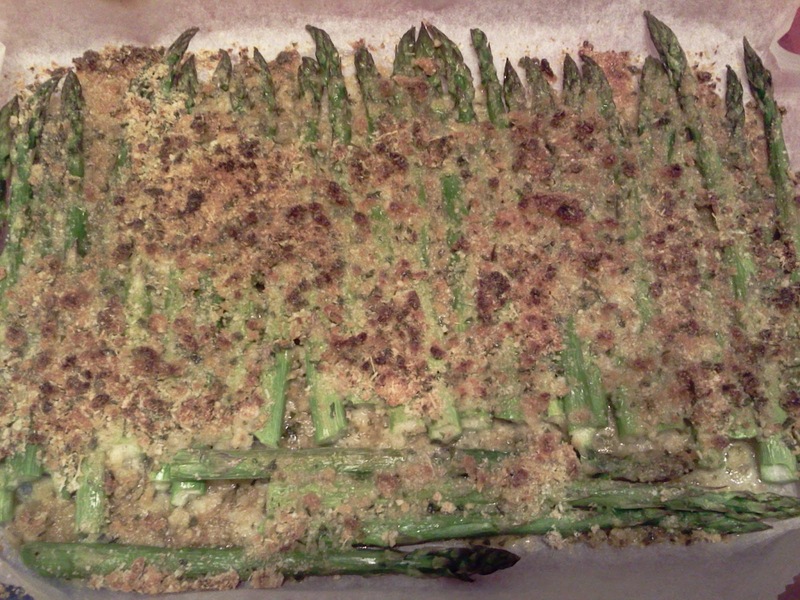 In a bowl, mix the rest of the ingredients and sprinkle the asparagus with the mix until they are all covered. Bake for 8 minutes, then cover with aluminium foil and bake for 5 more minutes. Take off the oven and let them cool before serving. Rinse the asparagus and cut the woodier ends, peel the stalks. Chop them and keep the tips apart. In a pan, fry the diced onion in the olive oil and add the rice. Let it toast for 1 minute and then add the wine. Let it evaporate and then add the chopped asparagus. Start pouring the stock: scoop by scoop while it cooks (do not let the rice dry or stick to the bottom of the pan) for 16 mins. approx. Stir often. A couple of minutes before the rice is fully cooked, add the asparagus' tips, toss and continue to pour the stock until the rice is fully cooked. Turn off the stove and add the butter and the parmigiano, mix until it has melted and serve.